What is intuitive eating? 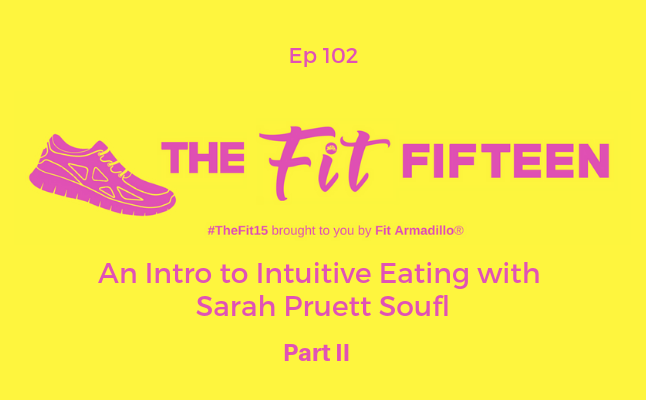 Registered dietitian Sarah Pruett Soufl comes back to uncover the final 6 of 10 principles of intuitive eating in this episode, the 2nd half of a conversation I had with her on this eating strategy. Learn more about intuitive eating and how it can help you start nurturing your body to find the weight you were meant to be so you can stop dieting and enjoy food again! #PodcastShow @TheFitFifteen by @FitArmadillo is back! #RegisteredDietitian Sarah Pruett Soufl answers the question: What is #IntuitiveEating? The Paleo Diet: Four Myths and the Truth about How our Ancestors Really Ate!